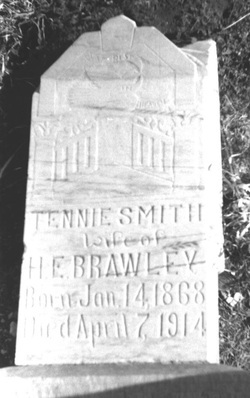 Terecia Tennessee Smith was born on Jan. 16, 1868, and spent her life in Collin County. For the past two years she was the victim of affliction. This suffering she bore with Christian fortitude until the end came on April 7, 1914. She was married to H. E. Brawley on May 29, 1898. To this happy union, three splendid children were born. They are as follows: Ollie, aged 15, years; Willie, aged 13 years; and Jewell, aged 11 years. She is survived by these children, her husband; and five sisters and three brothers, besides a host of friends. Her father and mother have preceded her to the Great Beyond. The deceased professed a faith in Christ 29 years ago, and united with the Methodist Church. She continuously lived a consistent Christian life. The funeral services were conducted at Murphy on Tuesday afternoon by Rev. J. Ben Snider of this city, after which the remains were laid to rest in the cemetery at that place. These papers extend condolence to the bereaved relatives and friends.